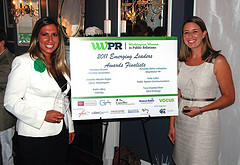 It was a pleasure serving as part of the judging panel for Washington Women in Public Relations’ (WWPR) 2012 Emerging Leaders Awards. Now in its third year, the program has continued to grow each year both in the number of award nominations and attendance. Competition was steep for this year’s awards and that made it difficult for those of us judging the nominations. In many cases, it was like splitting hairs to select the top six nominees! I’d call that a happy problem, though, and one that speaks well for the future of the public relations industry in the Washington, DC area. Sometime today, WWPR will announce the top six nominees via press release and social media so stay tuned. I can’t wait to see if my own top three favorites will be chosen at the program on the evening of July 17th at the National Press Club! For more details and to register, click here. PRofessional Solutions, LLC is proud to have served as a sponsor of the program since its inception and we look forward to another record turnout this year. Hope to see you there! This entry was posted in PRofessional Solutions News, Sponsorships, WWPR and tagged DC, public relations industry awards, Washington, Washington Women in Public Relations, WWPR, WWPR Emerging Leaders Awards. Bookmark the permalink.